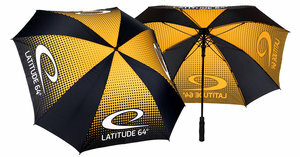 Stay dry during those rainy rounds with our all new 59" Square Umbrella. A foam non-slip handle provides a sure grip in all scenarios. The square design helps the umbrella stay in place when set down and covers a larger area to help keep all your gear dry. Includes branded storage sleeve. Material: 100% Polyester canopy, Fiberglass reinforced plastic shaft and internal ribbing system.